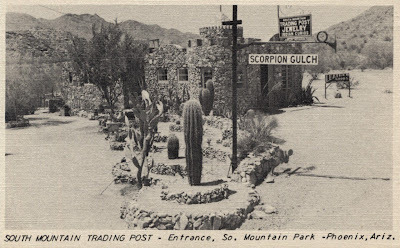 In the mid 1970s I used to stop at the bar across the road from Scorpion Gulch. It was closed in the mid 70s. The bar that I had the occasional beer in is now closed and boarded up. I just found an article in the Phoenix Gazette dated Dec. 13, 1966. On page 26 there was an article about a William Lunsford who ran the store. No word on when it opened or closed. It burned sometime since then, I'm still looking for more info. Email me if you want a copy of the article. See newer post about "Grandpa" who ran the store. William Lunsford was my great-grandfather. I'd love it if anyone could forward any information they have to me! Thanks! My family moved to the ponderosa stables around 1959 or 1960. The ponderosa was on the same side of Central as the trading post. South mountain was the first stable on that side . Across from ponderosa was ALL Western stables, it was next to the scorpion gulch bar, at that time Elmer King owned the bar.as we grew up I would spent a lot of time with grandpa bill and grandma jo. I helped them in the cactus garden and the store. Grandpa bill taught me to make silver and turquoise jewerly. When he decided to move my dad bought the trading post. We kept it open selling what jewerly was there and sacks. Closed the store I about 1967 or 1968. Moved in to it to live in may 1969.my family was the one that had a buzzer hooked up in case he needed help. It sure brings back memories of when in 1964 I would ride my Harley along with my girl friend Dusty out to the gulch,where we would sit for hours while sparking and dancing to the music played by te country band that was there. Those were some fun times we had. I have always wounderd what happened to that old bartender and bar. i had never heard of this place until this weekend. I asked the question on Facebook where to do a photo session with abandoned buildings or ruins. Many people suggested this destination. We brought the dogs, the camera and our pic-nic lunch. I LOVED IT. So grateful that its been left standing for us to appreciate and enjoy. It was a lot of fun. We will be back to do more photos.